Edited by Drs. 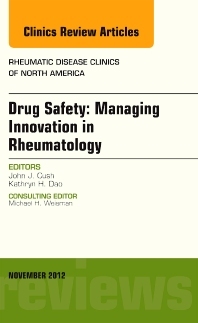 Jack Cush and Kathryn Dao, this issue of Rheumatic Disease Clinics of North America addresses one of the most significant issues facing the rheumatologist today––drug safety in a changing world where rheumatoid arthritis (RA) severity is less, patients are being identified and treated at a very early stage, and prevention is on the horizon. Topics covered include: communicating the risk of side effects, urate-lowering therapies, biphosphonates, biologics, malignancy risks, and administering therapies to patients with co-morbidities.